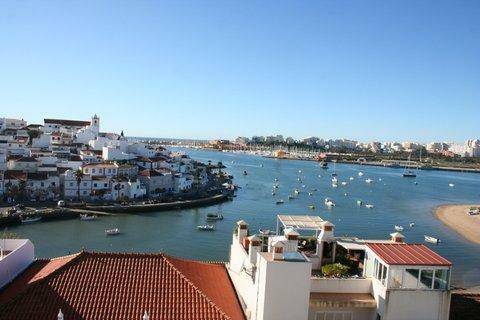 2 bed townhouse with sea and river views - Property for sale. Full Description: Ferragudo is regarded as one of the most attractive fishing villages in the Algarve. On the East bank of the river Arade it is still an active fishing village with local beaches adding to its attraction as a holiday destination. These 2 bedroom town houses are built on a hillside facing South and overlooking the still active fishing village of Ferragudo. Spectacular views of the Arade estuary and towards the sea can be seen from many of the rooms and the private roof terraces. Each property has a small private garden, some also have a swimming pool. Each town house has a large garage/basement which many owners have converted into a third bedroom. The first floor consists of a modern fitted kitchen, large lounge/dining room with fireplace and access to a terrace. On the first floor are two double bedrooms also with their own terraces. Stairs lead to a large private roof terrace offering spectacular views to the South of Ferragudo, river and sea. The garage/basement is fitted with water and power and can be converted into a third bedroom. The outside space consists of a small garden in which some of the properties have a small swimming pool. The village square is a short walk away as are the fresh fish restaurants for which this village is famous. Local beaches are also within walking distance or a short drive.